Argh! You want a portrait stack but the bellows get in the way. But there's a really simple trick to get portrait orientation out of a bellows set. Macro portrait using an extension tube to be able to make the portrait orientation possible. Insects lend themselves well to portrait shots if the antennae don't extend too much. The joint between a bellows set and a DSLR usually only allows landscape oriented photographs. The problem is the pentaprism at the top of the camera, which usually gets in the way if you try to rotate the camera by 90 degrees to make a portrait orientation image. The first thing that you could try is cropping just the part of the image that would make it into a portrait orientation shot. This is very easy but you lose a lot of detail this way as well. Extension tubes typically come bundled in a package that contains three sizes of tubes; mine are 36mm, 20mm & 12mm. Pentax bellows set. Modern Pentax cameras have a pentaprism that extends to the front and therefore the camera can't be used in portrait orientation. The solution is relatively simple: add a section of extension tube between the bellows end and the camera. 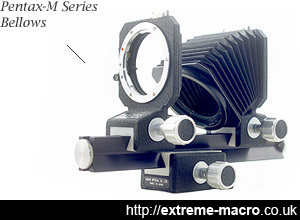 The really really simple way to make it very easy to make portrait oriented extreme macro shots with a bellows is just to add the smallest extension tube onto the bellows, and to fit your DSLR onto that. Adding an extension tube like this gives enough clearance to mount the camera at any angle you like without the pentaprism being blocked by the bellows set. The cheapest set of non-aperture linked extension tubes go for about £10 on eBay. Most bellows aren't linked anyway, so adding one of these into the mix might be the way to go if you're just using them for this purpose. I have the problem with the shackshot rail and lens combis that don't allow a lens collar. The easiest and cheapes solution is not to change te camera orientation, but to turn the object (and lighting!) 90 degrees. The Olympus OM Bellows unit comes standard with an adjustment lever at the camera end which allows rotation of the camera body to your preferred orientation. 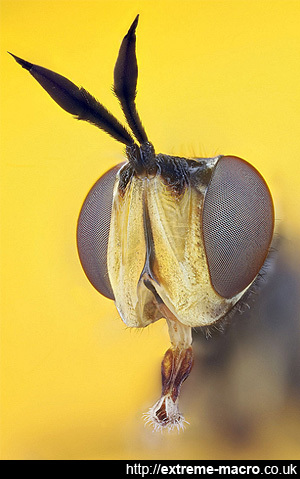 If any camera body part gets in the way of rotation, an extension tube normally solves the problem.